Bitter, cold; liver, gallbladder, lung and large intestine meridians entered. Clear heat and moisten dryness, relieve cough and dyspnea, remove toxicity. Asthma, jaundice, diarrhea, dysentery, sores and boils, constipation, pharyngitis, red eyes, pertussis, parched with thirst due to heat disease. 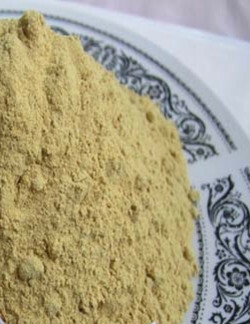 Dissolve in decoction, 0.3~0.6 g, or made into pill or powder. Proper dosage is for external application, pounded into powder for applying.